Spend your tokens on Crypto themed merchandise and services at Wave World Marketplace. How much, how frequently do you pay to leasers: Weekly on Mondays 100% LPOS Paid Weekly 100% Waves 100% earned MRT used to buy Waves World and 100% goes back to Leases plus 7.6 Million Waves World Token Airdrop each week to our Leases for one year June 2019. **Feature voting policy:Group Consensus. Voting is done by the community. Proposals are voted on each month. Submit a proposal for vote here https://wavesworld.io/marketplace/product/waves-world-community-proposal/ or visit t.me/wavesworld for more info or to chat with the Team. What development features do you usually support? How decide, etc… We ask the Waves World Community, and Lessors via Waves Platform Cryptocurrency Club https://www.facebook.com/groups/WavesPlatformCC/ and our Telegram Community. t.me/wavesworld We follow all Waves Platform news and updates. Waves World is a diverse blockchain ecosystem built around a major Waves mining pool and our crypto marketplace, which provides official Waves, and many other Blockchain related items. Our services are designed to engage and reward both our direct supporters and the wider crypto sector. We’re veterans of the blockchain space who are passionate about Waves and peer-to-peer technology, and have created Waves World for the grassroots community around the simple values of personal engagement and maximising the economic benefits we know crypto holds for the world. If you are Top 100 holder of (http://dev.pywaves.org/assets/AbunLGErT5ctzVN8MVjb4Ad9YgjpubB8Hqb17VxzfAck) Waves World tokens, you will automatically receive Waves World airdrops every day (currently 3500 WW) and be eligible for other exclusive rewards. The WW token will be embedded in our site and you may spend your rewards on all kinds of blockchain-related goods and services on the Waves World Marketplace (bit.ly/shopwavesworld) . We’re working on a series of further benefits aimed at expanding our Millionaires Club and the advantages we offer to them. Of course, anyone may shop at our marketplace and enjoy the increase in value for items you can purchase in our Marketplace. I apply repeatedly. I sent you my waves instead of leasing . I ask to check my transaction. I sent also 0,001 wsvea for the return of my facilities. Your silence strongly unhinged me. Sorry, did not see this message. I will look into it now. Your 10 Waves were sent back to you. Sorry I did not see the msg sooner. Wavesworld node is most bang for your buck, simple as that. 100% rewards + wavesworld tokens beats the other nodes by far. Better you check them for sure! Great Node and team! Good luck! The coolest nodes! Good luck guys! Great rewards. Expect big things from this team. Thank you for your support!!! Much more to come. TYVM for leasing to Waves World Node. 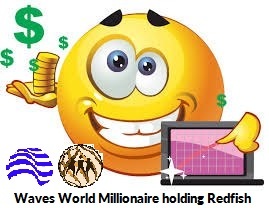 Waves World Leasing Payments Sent 15 OCT 2018 714 payments 7680980.00 Waves World Paid! 62.40520007 $ Waves paid! 1599.85 of $ MRT paid! Why at the next payment I stop renting my Waves at this node? A few weeks ago, I discovered this Waves node. I was excited about this project and I immediately rented my (few) Waves and bought 1 million Waves World. The first week of rental everything is going well. I receive 769 WW, MRTs and Waves. The second and third week, I receive only 1 WW !!! The fourth week, on the payment JSON files, I see that I have to receive 769 WW. A problem on the node and I receive only 1 WW instead of 769. Answer on Telegram? Any. So I lost 768 WW that were certainly distributed to a whale. Regarding this problem of 1 WW paid, a long conversation about the Telegram account of Waves World was initiated after my complaints. It turns out that the WW payout script uses homemade computation formulas instead of using the simple and highly equitable formulas used to pay for MRTs and Waves. It’s really a messy script… and nothing is done to fix the problems it generates. However, the solution exists: adapt the payment script of the MRTs and Waves to the payment of WW and it is not difficult because it is simply necessary to change the ID of the token and the total amount paid each week.